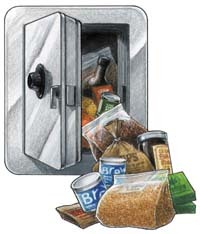 Since beer is considered a “fresh” beverage, keeping your brewing ingredients fresh is important to making great beer. Here are guidelines for storing your ingredients if you aren’t going to use them for some time after you have purchased them. Maybe you grow your own hops, and need to store 4 or 5 pounds of them. Or perhaps you only visit the homebrew shop every few months, and need to buy ingredients for four or five beers at a time. Like most other food ingredients, there are some basic rules that apply to storing your brewing ingredients. The three big enemies of your ingredients are heat, light and oxygen. Dry ingredients should also be kept in moisture-proof bags. If you control these factors, your ingredients will be ready when it’s time to make that next kölsch or porter. Malted barley should be protected from moisture and stored at temperatures between 50° and 70° F. Any quantity of malted barley, whether it’s a 50-pound sack of two-row or a one-pound bag of crystal, should be stored in containers that keep the grains airtight and dry. And the container should be able to keep bugs out; I once had a customer bring in an opened 50-pound bag of pale malt that was about half full. He had stored it for six months out in his garage, and when we opened the bag, it was swarming with tiny flies. I grabbed the bag and ran for the door, to avoid contaminating the rest of the grain in my store. Plastic bags you can seal (like a Ziploc) or rigid plastic 2- to 3-gallon containers with a sealing lid (like a trash can) are ideal for long-term storage. Uncrushed grain will store for a year in these conditions, and crushed grains will be good for two to three months. Big bags of grain usually come with a plastic lining inside. You can keep your grain in these or, to be extra careful, you can transfer the grain to airtight trash cans. This is recommended if you think you might have mice in your storage area. Dry malt extract should be stored just like grains. As long as the DME is dry and sealed from oxygen, you can buy in bulk, and use it for up to about 1 year. This assumes you keep it away from sunlight and maintain the temperature between 50° and 70° F.
Liquid malt syrup is easy to store as long as it is in the original can. This is an ideal container that keeps the syrup safe from light and oxygen, and the malt is good for about two years before it starts to degrade. The manufacturer has normally also heated the syrup to pasteurize it before shipping, so it is void of bacteria, molds and yeast. Most cans have an expiration date that helps you know when it is getting old. The same temperature range (50° to 70° F) applies. Liquid malt syrup that has been opened, or is sold in bulk plastic containers, has a much shorter shelf life. While buying malt syrup in this form is normally less expensive, it must be used in less than 3 months, or the syrup will degrade or even grow mold. If you have malt syrup in this form, the best way to store it is in the fridge. Pick the smallest possible container to eliminate airspace and avoid oxidation. While the extremely high sugar content inhibits yeast activity and molding, over a three- to four-month time period the syrup will lose its freshness. I sell bulk malt syrup in my store, where we pour the syrup from the drum into plastic buckets. We use nitrogen to push the syrup out of the drum to prevent oxidation of the malt inside the drum, but once the syrup is in the plastic bucket it has about a three-month shelf life before it needs to be used. If you buy bulk syrup, store it in a cool location, and use in less that six weeks. If you brew on an irregular basis, I would definitely suggest buying malt syrup in the cans packed and sealed by the manufacturer. Hops are very delicate, and great care is needed to store them. After hops are picked, the hop companies store the hops at a below-freezing temperature. You should do the same if you grow your own. Heat, light and oxygen are the big enemies of hop cones and pellets. I sell hops that are packed in oxygen- and light-barrier bags that are sealed under a vacuum. Hops stored in these bags are good for about a year if kept refrigerated. You should store your hops in your freezer to keep them fresh once opened. Try to seal them in an airtight bag, like a freezer-style Ziploc, that will effectively prevent them from absorbing any other food flavors in your freezer. I don’t think hops that are freezer burned or have absorbed flavors from last month’s leftovers will make good beer! 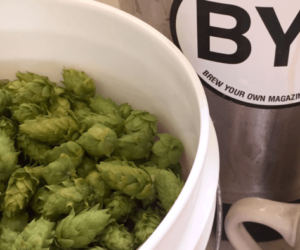 You can tell your hops have freezer-burn if they smell stale. Yeast is probably the easiest of all ingredients to store. Simply leave the yeast in the refrigerator until a few hours before you use it. Virtually all manufacturers print an expiration date on their packages, so just watch the dates to ensure you are using yeast that will work for you. Dry ingredients like spices, Irish moss, gypsum and Burton water salts should be kept in airtight bags at room temperature. The refrigerator normally has a relatively high humidity, and is not a good place for dry ingredients. Liquid ingredients normally are best stored in a cool dry place. The rest of your ingredients use the basic principles outlined here. If you keep your ingredients fresh, you will make the best beer possible.